As featured in The Times - Six of the best First World War reads. Nominated for the Maritime Foundation’s Mountbatten Maritime Award for Best Literary Contribution. Watch Nicholas Jellicoe and Graham Hobbs talk about their grandfathers' roles in the Battle of Jutland on the BBC - just scroll down. 'Even Nelson could not have done better at Jutland than my grandfather'; an article by Nicholas Jellicoe for the Daily Telegraph. You'll be £16.99 closer to your next £10.00 credit when you purchase Jutland. What's this? This book not only re-tells the story of the battle from both a British and German perspective based on the latest research, but it also helps clarify the context of Germany’s inevitable naval clash. It then traces the bitter dispute that ensued in the years after the smoke of war had cleared; right up to his death in 1935, Admiral Jellicoe was embroiled in what became known as the Jutland Controversy. Nick Jellicoe is uniquely placed to tell the story of Jutland. His naval connections are strong: his father, the second Earl served as First Lord of the Admiralty while his grandfather, Sir John Jellicoe commanded the Grand Fleet for the first two years on the war, from 1914 to 1916, and was famously described by Churchill as being the only man who could have lost the war in an afternoon. This new paperback edition has been completely revised and offers the best and most balanced account of the battle available and can be read alongside the author's interactive website. Deservedly praised at the time of its hardback edition, this revised paperback is even better. It is one of the milestone accounts of the battle of fleet clash between the British and Germans in WW1. NICHOLAS JELLICOE has lived his whole life under the shadow of Jutland. The ongoing controversy surrounding his grandfather’s actions on that day inspired him to undertake a major investigation of the battle and an analysis of the arguments that followed. This book is the result. 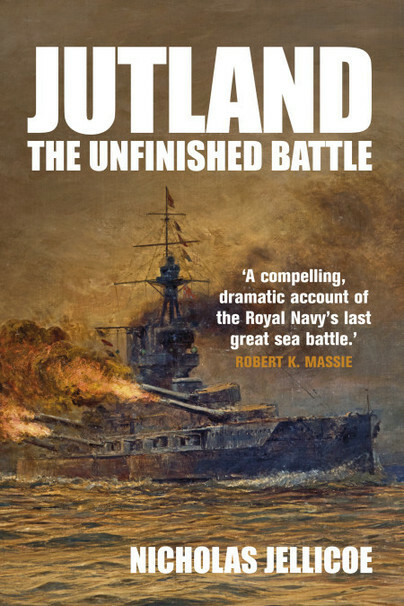 Nicholas Jellicoe was nominated for the Maritime Foundation’s Mountbatten Maritime Award for Best Literary Contribution for their book 'Jutland: The Unfinished Battle'.